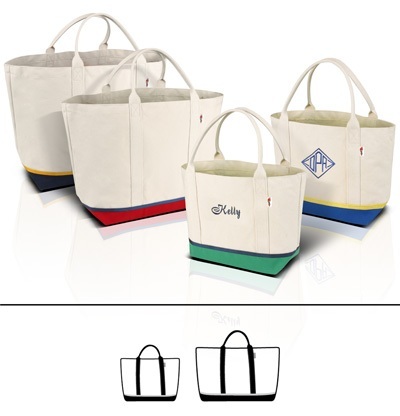 The Dock Tote combo uses the same 18oz. cotton duck construction as our Barrier Island Totes. With an addition 18oz. canvas bottom, these totes are practically indestructible. Handles are made from extra-heavy cotton webbing. Include these bags whenever outside fun is on the agenda. The X-Large Dock Tote is ideal for hauling groceries and other items for boaters, beach vacations and other extended stays. The all natural top and contrasting bottom with a colorful accent make this an ideal bag for monogramming initials or even a boat name for that special gift.